How much does it cost to travel to Kitzbuhel? How much money will you need in Kitzbuhel? €144 ($161) is the average daily price for traveling in Kitzbuhel. The average price of food for one day is €38 ($43). The average price of a hotel for a couple is €142 ($160). Additional pricing is in the table below. These average travel prices have been collected from other travelers to help you plan your own travel budget. An internationally renowned ski resort, Kitzbuhel is a part of one of the largest ski regions in Austria. Located about halfway between Innsbruck and Salzburg, the town is surrounded by the Kitzbuhler Alpen, which reach over 2,000 meters. The rugged terrain is a great location for skiing in the winter as well as hiking in the summer. Contributing to the area's fame as a ski resort are over 50 gondolas and ski lifts as well as nearly 170 kilometers of downhill slopes and about 40 kilometers of cross country ski trails. The 3S Cable Car in Kitzbuhel is especially notable, connecting the skiing areas of Kirch and Resterhohe over a length of 3,642 meters and reaching 400 meters from the ground at its highest point. Some skiing highlights of the area include Bergbahn Kitzbuhel, Element3 Ski School, and Skischule Kitzbuehel Rote Teufel. Schwarzsee Lake is another hot spot of Kitzbuhel. One of the warmest and most beautiful lakes in the Alps, Schwarzsee is home to waters that are known to have powerful healing properties. The lake is also a recreation area with many sports such as swimming in the municipal pool area, fishing, rowing and electric boats, fitness courses, and walking around the lake. The towns of Kitzbuhel, Aurach, Reith, and Jochberg are some of the most popular destinations for international sporting events in the state of Tyrol in the Kitzbühel Alps. Being a region popular with holiday-goers, there are plenty of opportunities for dining, shopping, and places to stay in each of the Alpine towns. 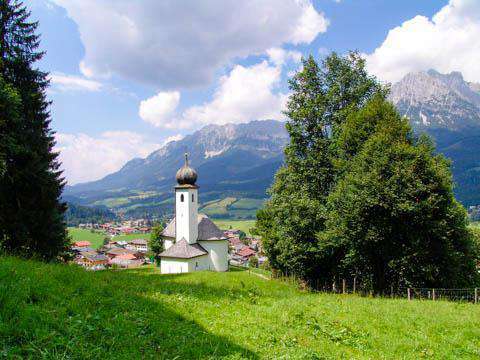 Ellmau is another renowned holiday destination, nestled within the picturesque Alpine countryside with a view of the Wilder Kaiser mountains and scenic steep hills of woods and meadows. Visitors vacation in Ellmau year-round. Wintertime activities include cross-country skiing, winter hiking, paragliding, snowshoeing, curling, and romantic carriage rides, while the summertime offers a climate ideal for walking, mountain biking, and climbing. The village itself has a number of bars and pubs and rustic huts for visitors to cozy up in the evenings and enjoy a drink or meal after a long day outdoors. There is even a 4.5 kilometer long illuminated toboggan run into the village called Astburg which stays lit until midnight. Other attractions include weekly ski shows with music and the Ellmauer KaiserBad (Imperial Baths) which features saunas, pools, slides, steam baths, Jacuzzis, and more. During the winter season, skiing is undoubtedly the activity of choice - both downhill and cross country. As mentioned earlier Kitzbuhel is a wonderland of ski lifts and cable cars, making navigation of the snowy slopes convenient for visitors. In the summer time, the rugged mountain landscape is just as popular for hikers. There are about 120 kilometers (75 miles) of mountain bike paths and about 500 kilometers (311 miles) of hiking trails. With the national sport of the region being skiing, Tyrol is host to the Hahnenkamm race, held on the mountains just outside of Kitzbuhel on the 3.3 kilometer-long course called the Streif. The race is held annually in late January, and is one of the most anticipated races of the world cup. Other attractions include tennis courts, golf courses, the Kitzbühel swimming pool, Austria's only curling hall, and the bathing lake of Schwarzsee. The cuisine of Austria varies depending on the region; however, dishes are generally composed of influences from throughout the former Austro-Hungarian Empire. Regional differences are usually significant of nearby nations like Italy, Hungary, Bohemia, Germany, and the Balkans, which have had an effect on Austrian cooking. Being located in the Austrian state of Tyrol, some of the local specialties of the region include Tyrolean bacon and all sorts of dumplings including Speckknödel (dumplings with pieces of bacon) and Spinatknodel (made of spinach). Tyrolean cuisine is generally very simple, as the people traditionally depended on farming on mountains and in valleys in the middle of the Alpine Region. Some common ingredients found in local dishes include milk, cheese, flour, and lard. In Kitzbuhel, some of the top restaurants as rated on TripAdvisor include Huberbrau Stuberl, Centro, Pano, Rosi's Sonnbergstuben, 1st Lobster, El Moro De Venezia, Gasthof Eggerwirt, and Berggasthof Hagstein, amongst others. Due to the town's location in the Alps, there is no airport very close to Kitzbuhel. The best option would be to fly into Innsbruck (about 90 kilometers west of Kitzbuhel), Salzburg (about 83 kilometers northeast of Kitzbuhel), or Munich (about 127 kilometers northwest of Kitzbuhel). Visitors can arrange transport from any of the airports to Kitzbuhel. By Train, Kitzbuhel lies on the route from Innsbruck to Zell am See.